I was chatting to one of my guildies the other day, and the subject turned to transmogrification. He mentioned he was most likely going to just transmogrify his gear to Tier 2, since he had no idea where to start building a custom outfit. Now, I’ve built custom outfits for most of my characters – so I figured I might as well write a guide. This is my way of doing this, obviously, not the Only True Way™, and if you prefer doing it some other way or you simply really love a tier set and just want to wear that, more power to you. Lots of images coming up to illustrate my point, so the rest of the post will be behind a cut. Following the announcement of transmogrification, I’ve been busy creating at least one set for each of my characters – two for my main (one for tanking, one for DPS). I know most people will just go with a full tier set, not care at all, or deliberately throw together the ugliest set they can, but I want to look stylish, damnit. So yeah, it took some time. In the process of creating the sets, I’ve managed to collect a list of resources and tools for World of Warcraft gear. Rather than have it sit and rot in my bookmarks, I figured I’d post it up and potentially have other people benefit from it as well. I’ll try to keep it updated as I find new things, but no guarantees. If you’ve not heard of WoW Model Viewer – what rock have you been living under? It’s a standalone program that allows you to see models for characters (and NPCs, but that’s beside the point as far as this list is concerned) and dress them up in your choice of armor and weapons. Note that sometimes, effects may be missing from armor and weapons – always double-check in game or by looking at screenshots on Wowhead to see what an item actually looks like. Obvious resource is obvious, but still very useful. 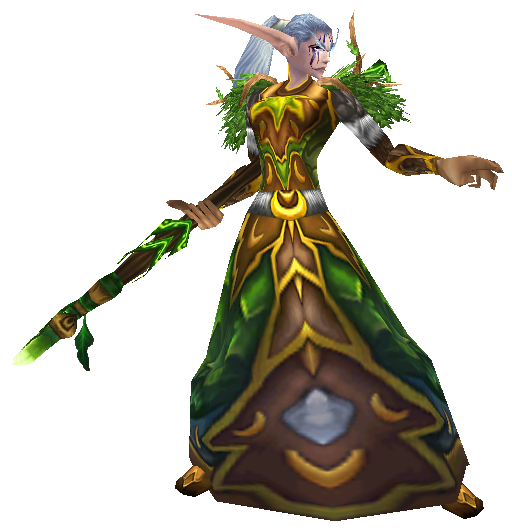 The Transmog Sets feature helped me a lot, as did the various transmogrification guides on their news blog. Convenient screenshots of all sets in the game, including both tier and non-tier gear? Yes, please. The link above leads to the page for cloth sets; guides for other armor types are also available. These lists focus on weapons usable by death knights that can be obtained (mostly) by yourself, rather than requiring the help of others. Good for people who play alone or don’t feel like constantly bugging their friends to help them run old raids for transmogrification items. What it says on the tin. Outfits, outfits and more outfits, categorized by armor type and, where necessary, by class. Lists and screenshots of armor and weapons, categorized by classes that can wear them. Each list includes the names of the items, with drop locations and Wowhead links. What it says on the tin – lists of leather sets, with a focus on druids (sorry, rogues), with screenshots showing all possible druid races of both genders. Plenty of screenshots, showing how the weapons look in the hands of a gnome. Not that I play a gnome, but still. A thorough look at weapon and shield models from a design perspective. An awesome resource, although posts stopped before all weapon types were reviewed. Lists and screenshots of weapons and armor. Armor is sorted by armor class and color, which can make this website very useful when you’re trying to color-match items.